June 2, 2009, 3:12 p.m.
By Zachary M. Seward @zseward June 2, 2009, 3:12 p.m. Even as he leads newspaper publishers toward charging for their websites, Steve Brill remains skeptical of one oft-mentioned model for making money online: micropayments. In our conversation yesterday, he told me that his startup, Journalism Online, isn’t expecting newspapers to reap much revenue from per-article fees, though readers will have that option. A common platform like the one under development at Journalism Online could help micropayments catch on since readers would need just one account to buy news across many sites. “They’ll just have to do it with one click because they’ll have a password,” Brill said. “They won’t have to set up an account every time they want to spend for an article.” On the other hand, there’s little overlap between the markets for paying readers of, say, The Philadelphia Inquirer and The San Francisco Chronicle. And while the 25-cent-per-article price point in Brill’s slides is just hypothetical, it’s worth noting that you can usually pick up the entire Boston Herald for a quarter at most commuter hubs around here. 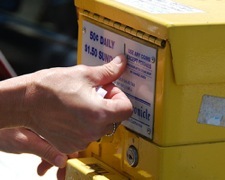 Photo of newspaper box by Steve Rhodes, used under a Creative Commons license. POSTED June 2, 2009, 3:12 p.m.
Seward, Zachary M.. "Micropayments? Steve Brill is not optimistic on per-article fees." Nieman Journalism Lab. Nieman Foundation for Journalism at Harvard, 2 Jun. 2009. Web. 18 Apr. 2019. Seward, Zachary M.. "Micropayments? Steve Brill is not optimistic on per-article fees." Nieman Journalism Lab. Last modified June 2, 2009. Accessed April 18, 2019. https://www.niemanlab.org/2009/06/micropayments-steve-brill-is-not-optimistic/.